He is known as a king of communication, but it seems Lord Mandelson's words are not to everybody's taste. The Plain English Campaign has awarded the business secretary its Foot in Mouth award for using "gobbledegook" when talking about MPs' expenses. He was criticised for asking people to look "round corners more thoroughly" to see the "big things the prime minister is getting right". The Metropolitan Police and Department of Health also received awards. Jargon is frequently cited as a problem in Whitehall, with politicians generally coming in for less criticism than officials. 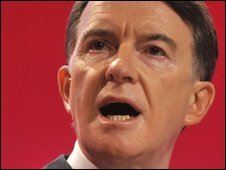 But Business Secretary Lord Mandelson earned a black mark from language campaigners for these comments, made in May: "Perhaps we need not more people looking round more corners, but the same people looking round more corners more thoroughly to avoid the small things detracting from the big things the prime minister is getting right." The Plain English Campaign also criticised the Metropolitan Police for its "continuing use of jargon and gobbledegook". The Department of Health was given a Golden Bull award after saying on a website: "Primary prevention includes health promotion and requires action on the determinants of health to present disease occurring. "It has been described as refocusing upstream to stop people falling in the waters of disease." American Airlines Also received a Golden Bull for sending a passenger a "property irregularity receipt". The Plain English Campaign described this as "an acknowledgement sent to a passenger that avoids the real problem of lost luggage". The Scottish Police Federation was praised for voting to use plain English throughout the force. Judges also gave the Royal British Legion a Plain English award for its use of language in fundraising information. Why do councils love jargon?